Jurassic beast, monster jaws scooping mouthfuls of rocks and cobble, seizing boulders the size of refrigerators, uprooting trees, pushing aside mounds of rubble as if they were feathers, roaring and clanking. Then, with a sudden personality change, it swivels its long neck around to gently sprinkle sand and gravel over the sloped river bank, pat it down with gentle bumps of its huge head, nudge rocks into place, scraping and smoothing the surface as if building a nest, then washing the dirt off the rocks with a slurp from the river water splashed onto the bank. 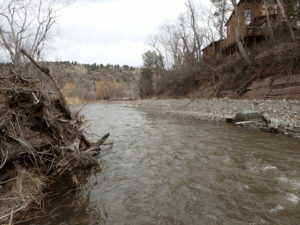 The 2013 Big Thompson River flood devastated trout habitat, leaving behind a “sluice-box” run of shallow water rushing down a uniform gradient with no holding water for trout. 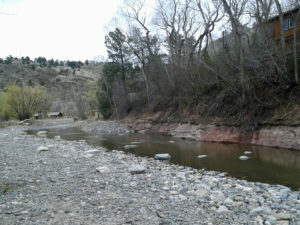 The Big Thompson Watershed Coalition obtained a flood recovery grant to restore the stream here at Sylvan Dale and in several other reaches of the river. Work was completed in May 2017 by Environmental Resource Consultants. The trout are happy. So are the anglers. Why Help Ranchers Improve Our Watershed?